For generations, our forefathers have been distilling whiskey from corn mostly hidden away from the long arm of the law. White lightning... hooch... moonshine. Known by many names, 'shine-making has crude origins, distilled and sold in a lucrative backwoods business that deprives the government of their fair share of tax revenue. 18th century Scots-Irish settlers to the U.S. brought with them methods for making whiskey without aging it, and these same recipes of questionable proof and quality are still made in Appalachia today. But nearly 30 years ago, one man began taking steps toward bringing this once elusive drink out of the woods and into our homes for us to enjoy without fear of recrimination, or even a bad reputation. 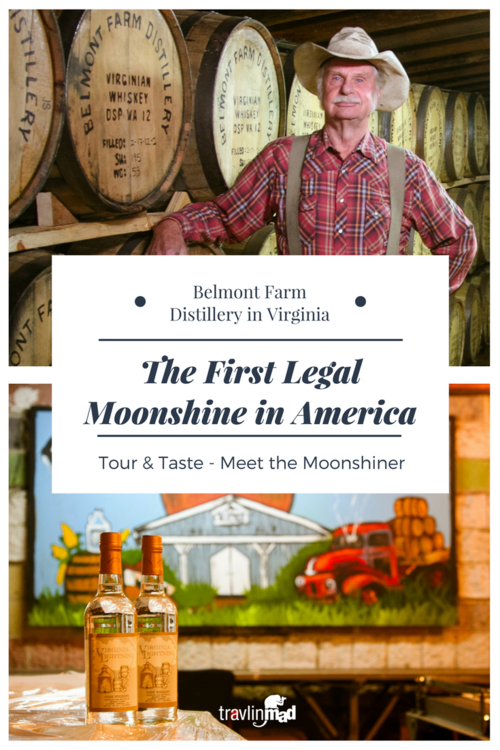 But if you'd rather not chance it with the backwoods bootleg, you can visit Belmont Farm Distillery in Culpeper, Virginia, and meet Check Miller, the man who made the first legal moonshine in America. Chuck and his wife Jeanette founded Belmont Farm Distillery on their farm in Virginia, making moonshine and carrying on a legacy left by his grandfather who ran illegal moonshine in his day up to northern Virginia and into Washington D.C. Chuck remembers his grandfather as a dairy farmer. Two generations later, as the mural in his bottling room attests, Prohibition is over! Armed with a higher education (you should see his state-of-the-art reverse osmosis system) and a pilot's license (he flew in Vietnam and commercial for Eastern Airlines), Chuck spent years completing reams of paperwork and maneuvering through bureaucratic red tape. Getting the license from the Bureau of Alcohol, Tobacco, and Firearms took a few years, but in 1988 he became the first legal moonshiner in the United States. In recent years the moonshine craze has really caught on, leaving the rural backwoods and making a splash in glitzy bars from South Beach to Hollywood. The fascination with moonshine has become so popular in fact, that the bootleg beginnings of illegal 'shine-making continue to make shows like Moonshiners a huge hit for The Discovery Channel, a reminder that much of the stuff is still made under cover. With its recent popularity, one might easily mistake this as an overnight sensation. But like many trends, nearly thirty years of groundwork has been laid by Chuck for others to grab hold. He's inspired countless up-and-coming artisans and entrepreneurs, resulting in the recent rise of the Craft Distillery movement in Virginia and around the country. Today he's among just a handful of moonshine distilleries and 42 craft distilleries operating in Virginia alone. If you visit Belmont Farm in Virginia, you'll get a catered tour from the man himself if he's around, which he usually is. Chuck is a likable guy with a signature look. You'll likely hear him before you see him in his cowboy hat and plaid shirt because he'll beat you to the hello. "Hi, I'm Chuck Miller" he boomed with a grin and a twang the first time I ever met him years ago. He says the same to everyone he meets and calls himself Moonshine Chuck. You might wonder how moonshine differs from other corn-distilled liquors like, say, the popular Jack Daniels whiskey, which is made from corn, rye, and malted barley, then filtered through stacks of sugar maple charcoal and barrel aged anywhere from 4-12 years. It's all about the process and aging. The legal moonshine here is distilled slow in a copper pot to preserve all of the aroma and taste of a fine fresh corn whiskey. Chuck continues the tradition of pot still whiskey production with his centerpiece copper pot still he bought back from the Feds. He says it's what gives his moonshine that unique flavor. Belmont Farm is also the only distillery in the U.S. that grows its own grain. The Millers grow their own corn on the farm, harvest it, grind it, and distill it, all the way to the final bottling. And as luck would have it, any byproduct of all this distilling is eagerly consumed by the neighborhood cows, making it a sustainable agricultural enterprise. Farmers in Culpeper laugh recalling how their cows would come running when Chuck delivered corn mash from the back of his old pickup truck with no muffler. "They were some happy cows" he said with a grin. It's hard to pinpoint the secret behind Belmont Farms' Virginia Whiskey. Maybe it's the apple wood Chuck toasts on a grill out back. I've seen him cutting and toasting rounds of wood over a fire like you'd grill a hamburger. When he's satisfied with the char, he gathers them up in a giant teabag and submerges it in a vat of moonshine, the first step toward turning it into the amber-colored Virginia Whiskey. His 'cooking' is aged in oak barrels for four years, then hand selected in small batches to preserve its uniqueness. The result is a whiskey that's smooth and mellow, with a hint of that apple wood char from the grill. Belmont's bottling room has grown by leaps and bounds over the years and if you visit on a Wednesday, you might get to see some bottling in action. Depending on the day, you might also find them bottling their signature twice-distilled Virginia Lightning moonshine, Kopper Kettle Whiskey or Kopper Kettle Vodka. Belmont Farm also officially bottle's Moonshiners' Tim Smith's Climax moonshine. Chuck estimates that the distillery now sells around 10,000 cases - 120,000 bottles - a year. The filtration room is next on the tour with that state-of-the-art reverse osmosis system I mentioned. He's proud of this technology and swears it helps make the moonshine so smooth. Around the corner is the cool and aromatic barrel room with long rows of oak barrels lining either side. Here is where clear moonshine is aged in oak barrels to become Belmont Farm's Virginia Whiskey. A large barrel of Virginia Whiskey he's been aging for 25 years sits in the corner, just about ready for bottling, though he admits there's only about a half-barrel left. "We've been sampling it for quite a while now, so it's not quite a full barrel anymore!" That sweet, fermented aroma in the air of the barrel room is the natural exchange from the soaked barrel wood evaporating into the air, or what's known as the angel's share. One smell of this room and you get a good idea of what's ahead in the tasting room. Up until a few years ago, the tour at Belmont Farm was fun, but largely a tease - leading you through the process of distillation, bottling, and barreling, only to end the tour at the Gift Shop, your thirst for tasting the goods left unquenched. But in 2014, after more paperwork, the government finally conceded and approved that missing piece of the moonshine tour. Now every tour ends on the right note with a proper tasting of Cherry or Apple Pie moonshine. I had the pleasure of working with Chuck and his wife Jeanette when I worked in tourism development and marketing in that part of Virginia. Belmont Farm Distillery is one of the most popular tourism attractions there, and visitors travel from around the world to see it, with good reason. Since Culpeper and central Virginia are largely agricultural, Chuck's influence helped to preserve and promote much of its agricultural heritage. He saw the benefit of agritourism for the entire community long before most people knew there was such a thing. Tasting all the various flavors of moonshine at Belmont Farm begs the question...how exactly did he come up with all these flavor combinations? I found out one day when Chuck invited me into his "test kitchen" at the end of a long tour, a small closet of a room with cabinets, a large fridge, and lots of mason jars on the counter. Those early experimental concoctions of strawberry, peach, cherry, and apple moonshine were tested and refined - and re-tested and re-refined - and eventually led to popular new product lines of flavored moonshine. In 2016 two new flavors were launched: Peach and Butterscotch. Come on.... Peach! 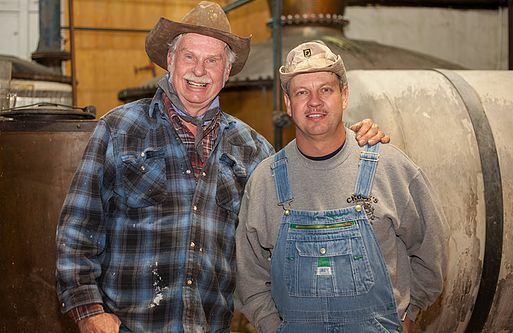 The Miller family moonshine legacy continues today with Chuck passing on his knowledge to their new Master Distller, son-in-law Jay Durkee, who's bringing plenty of new ideas and products with him. Chuck is also lending expertise (and licensing) to other celebrity bootleggers like Moonshiners' Tim Smith. You've no doubt seen Chuck on the show in one of his many cameo appearances. He pioneered the recent wave of moonshine mania that shows no signs of slowing down and he clearly relishes the notoriety that goes along with it. It's a role he was born to play. Today, after years of sheer grit, determination, and love for the business - the 25-year kind you need to affect a cultural change - Belmont Farm Distillery is the oldest craft moonshine distillery in the country. He and Jeanette have become celebrities, and new products like golden gin, vodka, and rum are flying off his bottling line with no end in sight. I mentioned to him when we spoke recently that he must be doing well - I was seeing him on TV and everywhere these days. He laughed. This post contains affiliate links. If you click through and make a purchase, we may receive a small commission at no additional cost to you. There are many different kinds of accommodations in Culpeper, from luxury Inns and cozy B&Bs to mid-range hotel chains. Check out some of my favorite places to stay in Virginia here. Thyme Inn in Culpeper is a true historic gem and luxury boutique stay in the heart of the historic downtown. A favorite local restaurant, It's About Thyme, is just next door. Suites at 249 in downtown Culpeper is also a great choice, just steps from the Amtrak train stop. It's a fresh and modern boutique hotel. Check rates and details. Belmont Farm Distillery is just south of Culpeper on your way to Madison and Orange, so consider a stay there too. We highly recommend The Inn at Willow Grove Inn is a beautiful Inn and destination all its own just down the road from the distillery on Route 15. Search rates and availability. Belmont Farm Distillery is open seasonally, April thru November. You can buy moonshine in Virginia ABC stores, or order their products online. The tour is FREE. Tastings are also available - up to 3 oz (or 1/2 oz each for up to 6 products). 'Shine On - Check out some new and unique craft cocktail recipes for your next get together!